Why Can't Transportation Mega-Projects Be Both Beautiful and Practical? In New York City's $4 billion PATH Hub, form overtakes function. Nestled among the skyscrapers of Midtown Manhattan, at the crossroads of 42nd Street and Park Avenue, rests the 101-year-old Grand Central Terminal. Designed by the early-20th-Century architectural powerhouses of Reed and Stem and Warren and Wetmore, this Beaux-Arts masterpiece, along with the Park Avenue tunnels, cost nearly $3 billion in today's money, and provided a regional and intercity connection for a growing New York City. Today, approximately 700,000 travelers, commuters, and tourists pass through its sweeping halls and stair-less design on a daily basis. Grand Central wasn't cheap, but it worked in the Gilded Age and it works now, a triumph of design and utility alike. Fast forward a century and head south a few miles. In Lower Manhattan, a new train terminal arises. This one too comes with a star-studded architect behind it, and it too is being constructed in and around an active subway station. It's also going to cost an unheard-of amount by the time construction is over. I am, of course, referring to the Port Authority's Santiago Calatrava World Trade Center PATH Hub, a $4 billion behemoth at Ground Zero that will serve around up to 40,000 PATH passengers per day. Under construction for seven years, it is set to open in 2015 and has come to stand for the debate over design, cost and a public agency's responsibility to the public. Calatrava's PATH Hub looms physically and metaphorically over transit planning in New York City. The stark white design of Calatrava's rafters hulk over the streets even as the visible joints and rust coloring give it a rundown urban chic look. From above, the building appears downright ionic. Inside, the white marble hallways designed to accommodate 200,000 pedestrians glisten, with light bouncing off in every direction. One day, this underground passage will host a high-end mall from the Cortlandt Street 1 train station to Brookfield Plaza, and the mall will offset the expense. It was supposed to be a subway station. From a practical perspective, where Grand Central seamlessly integrates commuters with its purpose as a rail depot, the Port Authority's new hub fails its customers, the PATH-riding public. One platform is already completed, and its design flaws are obvious. Staircases are too narrow to accommodate the morning crowds who come streaming out of the trains from Hoboken, Jersey City, and beyond, while the narrow platforms quickly fill with irate commuters. Anyone trying to catch a train back to the Garden State risks a stampede. The marble, bright and sterile, picks up any spill, and a drop of water creates dangerously slippery conditions until a Port Authority janitor scurries out of some unseen door, mop in hand. Passenger flow and comfort, two of the most important elements of terminal design, seem to be an afterthought. The PATH Hub is shaping up to be an example of design divorced from purpose. The price tag too creates consternation among those fighting for sparse transit dollars. For $4 billion, the Port Authority could have extended PATH to Brooklyn, built a one-seat ride from Lower Manhattan to JFK Airport or helped cover the cost overruns from the dearly departed ARC Tunnel. 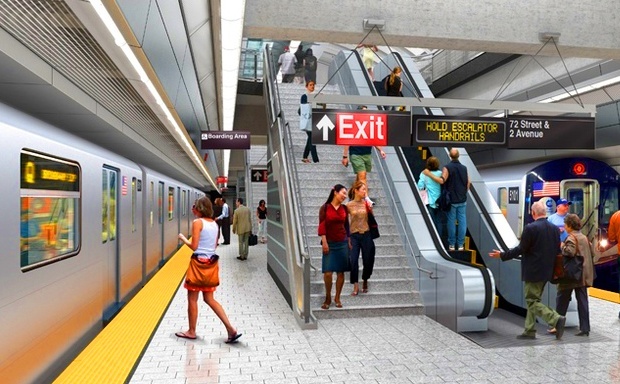 For $4 billion, the MTA could build out most, if not all, of another phase of the Second Avenue subway or the lost 7 line station at 41st Street and 10th Avenue five times over. At a time with real needs for regional transportation improvements, a $4 billion missed opportunity stings. It wasn't supposed to be like this. Calatrava's station was originally expected to cost $2 billion, and it was to feature fewer of the rusting rafters and a retractable roof. But as the costs have soared, so too have the design compromises, and it's hard to divorce the two. Not one to mince words, the New York Post called it an "elephantine excess … of bureaucracy-fed vainglory." With no strong Port Authority leadership or oversight, and countless politicians hoping to make their marks, Calatrava was given carte blanche to rework his design to fit warring factions' needs, and costs went up without bounds. The Port Authority delegated its project management to nowhere, and we are stuck with a building that falls far short of its transportation purposes. The only real transit capacity increases in this $4 billion subway stop are lengthened platforms for longer trains. On a national level, the Calatrava PATH Hub is symbolic of the battle between form and function, between architects and planners, between grand visions and out of control costs, between utilitarian pragmatists and starchitects looking to leave their mark. The story has played out in the funding and construction of San Francisco's Bay Bridge, and could rear its head again in the $1.5 billion plan to rebuild Penn Station in the Daniel Patrick Moynihan Post Office across the street that eschews additional trans-Hudson rail capacity. The sacrificing of passenger needs for design flourishes happens everywhere. Form and function was an achievable balance 100 years ago, as the lasting grandeur of Grand Central proves. Why can't we do the same today? In his writings and lectures on "Why Architecture Matters," the architectural critic Paul Goldberger writes: "When architecture is art, it does not escape the obligation to be practical, and its practical shortcomings should not be forgiven." Politicians choose architects who create buildings with visual designs that leave a mark in the public memory. For an occasional visitor to Lower Manhattan, Calatrava's building is a sight to see, but for an occasional PATH rider, Caltrava's platforms and staircases are a reminder that transit users in the eyes of celebrity crafters are afterthoughts. The riders don't post photos to Instagram and swoon over a stegosaurus-like structure rising out of the ashes of the Twin Towers; they grumble about narrow staircases and shoddy construction. Transit advocates are often accused of being too willing to sacrifice beauty for function. Would I rather have a drab box with more Hudson River crossings than a station headhouse that invokes memories and a feeling of appreciation for transit design and architectural beauty? No. But I would rather spend $4 billion to improve regional mobility than assuage the whims of another Calatrava. Of course, there must be a middle ground; there always is. Form and function was an achievable balance over 100 years ago, as the lasting grandeur of Grand Central proves. Why can't we do the same today? Benjamin Kabak is the editor of Second Ave. Sagas, a leading news blog following all things transit in New York City. He is also a practicing technology attorney at a boutique firm in Manhattan and earned his degrees from the New York University School of Law and Swarthmore College.